On The Path: Great Day to Live in Wisconsin! Today was a great day for me. I actually got up well before the alarm and got a ton of work done at the office. Most importantly I voted today in the Spring Elections. Speaking of Spring, as the below picture shows, Spring is starting to kick in around here. 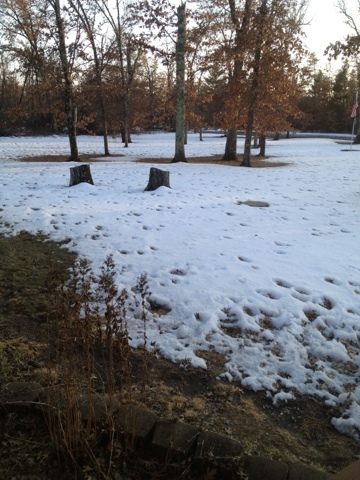 The frost went out last Sunday (at least at my place) and the yard is losing it's snow cover at a pretty good pace. And to top it all off, I was able to track down and buy a firearm I've had my I on for quite some time. And at a decent price to boot! I'll be picking it up from my auto mechanic in a couple of days. Got to love my little Wisconsin town, where the auto mechanic has a FFL. Even though it's having a rough run right now, I'm reminded today what a great country this place still is. I'm able to work, to vote, to purchase a gun, to take the time to simply enjoy the changing of the seasons, and to write exactly how I feel about it and publish it in a place where anyone in the world can see it and read it if they so choose. I know some people who read this my not like the buying a gun part and I respect there view. But they too can agree with me about the rest of my statement. If we, as a country, would take a collective step back and see how good we still have it and what common ground still remains, maybe we can quit dividing this country.